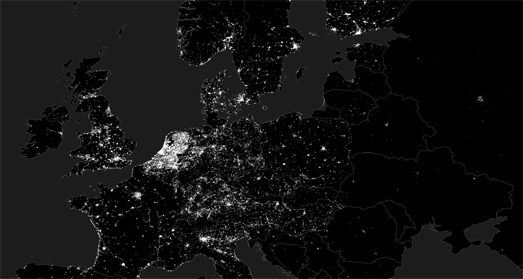 Roman Kyrychenko has used OpenStreetMap data to create a map showing all of Europe's cycle paths. The map provides an interesting overview of Europe's cycling infrastructure and a reasonable guide to which countries in Europe have the most developed bike path networks. The European Map of Cycle Paths is only a static map but the Random Forest blog has posted it as a large image so you can get a reasonable picture of the bike networks in every European country. The Netherlands and Belgium really stand out on the map as having extensive cycle networks. The populated areas of Scandinavia also seem to have lots of biking infrastructure as do many of Europe's largest cities. As the Random Forest blog points out Eastern Europe doesn't have as many bike paths as Western Europe. In fact the further you move east in Europe the less bike paths there seem to be. I'm not aware of any similar map of bike paths for the USA. But if you are interested in cycling levels in America then you should read the League of American Bicyclist's Analysis of Bicycle Commuting in American Cities (PDF). This annual report explores the levels of cycling in the USA based on data from the American Community Survey. New York City, Portland and Chicago are the top three cities with the most numbers of people cycling to works. In terms of the percentage of the workforce who cycle then Portland and Washington, DC are the top cities (in the 70 largest US cities). Of course this doesn't really tell us much about the infrastructure for safe biking in these cities.